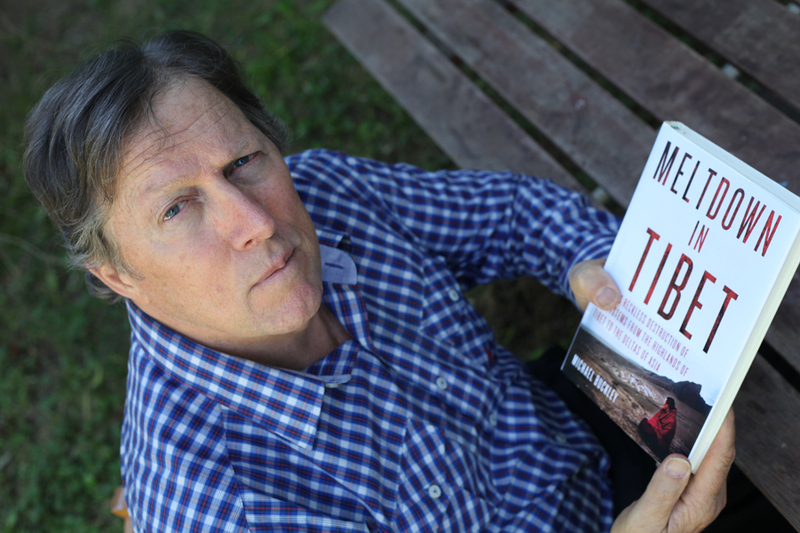 Adventure travel writer Michael Buckley calls the desecration of the Tibetan Plateau by occupying Chinese as a disaster of Biblical proportions, giving rise to Meltdown in Tibet (Palgrave/Macmillan & Raincoast 2014). With the arrival of the train in Tibet, large-scale mining of lithium, gold, copper, lead, crude oil, natural gas and other resources is underway to feed China's voracious industrial sector. Canadian mining companies are complicit in the mining, pollution and enviromental damage. None of this benefits Tibetans. In fact, mining pollutes drinking water and kills the livestock. According to Michael Buckley, the degree of environmental damage is viewable on Google Earth. In a nutshell, one way or another, over a billion people will be seriously affected by Chinese mining and megadams in the Tibetan Plateau-a figure that includes Chinese downstream on the Yellow and Yangtse rivers (leading to Yangtse Delta and Yellow River Delta). The major trans-boundary rivers that will be impacted by China's dam-building and mining are the Mekong, the Salween (starting up with string of megadams now), and the Yarlung Tsangpo which runs from Tibet through Bangladesh and India (with start-up of five new megadams in Tibet, as well as extensive mining close to the river). The subtitle of Buckley's book is China's reckless destruction of ecosystems from the highlights of Tibet to the deltas of Asia. Buckley is also filmmaker for three short documentaries about major environmental problems in Tibet. As a photographer and videographer, Buckley is equally at home in Asia, India or the Himalayas. He has travelled widely on seven continents, and thrives on adventuring in remote areas-rappelling from the treetops of Costa Rica, cave-kayaking in Thailand, bicycling over high passes on the Karakoram Highway, trekking over a snowbound pass at Mount Kailash, chasing rare mammals in Bhutan, or diving with manta rays in the tropical waters of Borneo. He is author or co-author of ten books about Asian and Himalayan travel, including Eccentric Explorers: Unravelling the Mysteries of Tibet (Crazyhorse 2008), a biography-based book about ten adventurers to the Tibetan plateau. This book won the Biography category at the National Indie Excellence Awards in California in 2009. Other titles include Shangri-La: A Travel Guide to the Himalayan Dream (2008); Tibet: the Bradt Travel Guide (2012); Heartlands: Travels in the Tibetan World (2002); and a guidebook to Indochina titled Vietnam, Cambodia and Laos. (2006). One of his earlier books is Bangkok Handbook. In Cycling to Xian & Other Excursions he describes his 4,000-mile journey through China overland to Kathmandu, half of it by bicycle. Buckley's feature stories have appeared in dozens of magazines, newspapers and other sources. Buckley believes travel is transformation. "Travel cuts across barriers of time and space. It gives you a special sense of being wide awake-everything is new and different and magical, and there's so much to be discovered, so much to learn. Real travel means encountering people whose way of life is very different from your own and learning from them." "What's happening in Tibet right now," says Vancouver's Michael Buckley, author of Cycling to Xian & Other Excursions (Crazyhorse Press $14.95), "is disastrous. Whole monasteries are being wiped out." Tibet is currently closed to foreigners. News of the country is scarce and unreliable. The Chinese retain control by military force. The English-born Buckley was able to see the current political struggles brewing in 1985 and 1986 when he travelled 4,000 miles overland from Shanghai to Kathmandu, making half of his journey by bicycle, with neither sponsors or Chinese permission for his journey. "The Chinese weren't communicating with the Tibetans at all," he says, "They looked down on them. For instance, once when my partner and I stayed at a Chinese army base, we gave the soldiers a Frisbee to play with. A crowd of locals gathered, just curious. "The soldiers started throwing rocks at the Tibetans, driving them away, without any provocation. We asked why they did it. We were told, 'Because the Tibetans are stupid. They don't speak Chinese.' We told the soldiers that we didn't speak Chinese either." Having co-authored two books on Tibet and China for the Australia-based Lonely Planet series, Buckley is going it alone with Cycling To Xian. "The publishers I submitted the manuscript to said, 'Yes, looks good, but the travel books already out there have cornered the market.'" Giving new meaning to the term mountain bike, Buckley is now trying to market Cycling to Xian with the assistance of Vancouver's Worldwide Maps and Books on Granville Street. Meanwhile he tries to keep abreast of Tibetan affairs. "On March 5th, the main Jokhang temple in the middle of Lhasa was stormed by Chinese troops," he says, "The monks had no weapons. They threw rocks. Two Chinese policemen and 18 monks were killed." Adventure travel writer Michael Buckley of Vancouver explains the genesis of Meltdown in Tibet, (Raincoast $31.50) sure to be one of the most internationally discussed books of the year. Sometimes you just fall right into a story. In late 2005, I returned to Tibet intent on updating my guidebook to the troubled region, and to check out the completion of the new railway linking China with Tibet for the first time. The new Golmud-Lhasa line was completed at a cost of over US$4 billion, more than the entire budget spent in Tibet on education and healthcare since the Chinese invasion in 1950. This railway was not built for philanthropic purposes. My railway investigation got derailed when, out of curiosity, I decided to take a one-day rafting trip from Lhasa. This was a pure adrenaline rush: riding the wildest whitewater I'd ever been on. But the rafting guides lamented the fact that the rivers were being compromised by the building of massive dams by Chinese engineers. I'd never heard of major dam-building in Tibet. And yet it made perfect sense: the biggest drops of any river in the world are in Tibet, so there's huge hydro potential. The more I delved into this hydro development, the scarier it became. It soon became evident that China had its hand on the tap for the water that feeds most of Asia through Tibet's mighty rivers-the Mekohng, Salween and Yarlung Tsangp (Brahmaputra) in particular. I took as much undercover video footage as I could on this trip not knowing what I would do with it, but shooting anyway. I figured, as a guidebook writer, if I didn't know anything about these new megadams, few Westerners would know about them either. China severely restricts access to foreign journalists entering Tibet, and imposes a reign of terror to silence Tibetans within Tibet. Despite this, Tibetans have bravely protested against dams and mining at great risk, with a number killed, injured or locked away for long prison terms. Under the highly repressive Chinese regime, Tibetans have been given sentences of five years or more for simply writing an email, making a phone-call or singing a song critical of Chinese policy. Back in 1986, when I cycled from Lhasa to Kathmandu, I had been dazzled by Tibet's incredible wide-open spaces, drinking in the towering snowcaps, the ethereal lakes, and huge grasslands. When you are on a mountain bike, you feel rather insignificant next to the highest peaks on earth. Our small group of mountain-bikers had skirted Lake Yamdrok Tso, a turquoise beauty that is highly revered by Tibetans. But ten years later, the lake had been defiled by a highly controversial pumped-storage hydro system, supplying energy to Lhasa. Tibetan protest to save the sacred lake fell on deaf ears. I assumed that Tibet's incredible natural beauty would always be there for future travellers to enjoy. But instead, I found it changing right before my eyes. What struck me was the incredible speed of change accelerated by the arrival of the new railway in Lhasa. The building of that railway was facilitated by the involvement of Montreal-based Bombardier and Power Corporation (building special high-altitude rail-cars), Nortel (communication network for the Lhasa railway), and other corporations from Canada. That railway makes it possible to exploit Tibet's resources on a large scale, by bringing Chinese migrants workers in by the train-load, and by shipping minerals out economically. The migrant workers build dams or work at mining sites. Up to 20,000 Chinese migrant workers might descend on a remote valley in Tibet to build a megadam. Returning to Vancouver in 2006, I could find very little about damming Tibet's rivers in Western media, so I set out to make a short documentary about it-a film called Meltdown in Tibet. I didn't know how to put a film together, but in the digital age, you can basically do it all on a laptop. There is a steep learning curve involved in mastering the software. One skill transferable from years of writing was the ability to edit video to forge a storyline. Cutting and pasting of video, stills and music came naturally to me. The documentary was finally completed in 2009. It screened on the fringes of the UN Climate Change Conference, in Copenhagen, in December that year, and at dozens of other venues worldwide. It didn't screen as a great visual experience. It screened because few people had heard of the environmental issues portrayed. In 2010, I went back to Tibet to shoot video for another short documentary about the sad demise of Tibetan nomads who have been forcibly shifted off their traditional grassland habitat and moved into concrete ghettoes. On an earlier trip, my guide Dorje told me that Chinese officials created massive national parks in Tibet, but these were "paper parks";-made as an excuse to get rid of nomads. Tibetan nomads are the stewards of the vast grasslands of Tibet. Over the course of 4,000 years, they have developed an ingenious culture that depends on their herds of yaks, sheep and goats. The yak provides everything from milk, cheese and curd to shelter (yak-hair tents), clothing (yak-skin boots) and ropes. The comical yak resembles a cow with dreadlocks. They derive from wild yak stock. Wild yaks are double the size of domesticated yaks, and your chances of spotting one are rare: there are thought to be fewer than a thousand wild yaks remaining on the Tibetan plateau. Their numbers were annihilated by Chinese settlers and military, who machine-gunned them for food and for sport. The wild yak has gone the way of the bison in 19th-century America. Similar to native American peoples like the Blackfoot Indians, Tibetan nomads have become beggars in their own land, with their culture decimated by the Chinese policy of resettlement. As an excuse to settle Tibetan nomads, Chinese propagandists blame deteriorating grassland quality on overgrazing by nomads, but the fact is that extensive Chinese mining is the main culprit. Tibet has huge reserves of lithium, copper, gold and other precious metals. And here, Canadian mining corporations have been at the forefront. These mining companies are exploiting mineral, oil and gas resources in a region occupied by an invading force (China), without regard for the environment, and without consulting the Tibetans-who vigorously oppose mining because it poisons their rivers, their livestock and their crops. The poisoning of rivers due to extensive mining in Tibet now has the potential to go all the way downstream into Asia, threatening the lives of millions of people stretching from Vietnam to Pakistan. A handful of Canadian mining corporations, mostly based in Vancouver, set up operations in Tibet: they were needed for their advanced technology and know-how. These included Continental Minerals, Sterling Group; and Inter-Citic, El Dorado Gold Corp and Tri-River Ventures. But as the mines moved closer to production, Chinese officials stonewalled on permits, and most of those companies were forced to sell out to state-run mining ventures. This has not happened to China Gold International Resources, based in Vancouver because it is essentially owned by the Chinese Communist Party, which is using the Canadian stock market to raise revenue to exploit Tibet's valuable resources. In 2010, China Gold acquired the extensive copper-gold mining site of Gyama, east of Lhasa. The venture was touted as a model mine, using the best mining practices. But on March 29, 2013, a massive mud-rock avalanche buried 83 miners at a mountain location near Gyama. Critics of the operation claim this tragedy occurred due to hasty mining done without concern for safety. Security is very tight at remote mining locations. I couldn't go to Tibet to get video footage of mines. Instead I dropped in on mining sites from 400 kilometres overhead, virtually riding a satellite relaying Google Earth satellite imagery. After obtaining permission from Google Earth to use flyovers, I put together a short documentary about mineral exploitation in Tibet, called Plundering Tibet, released for film festival screenings in conjunction with the new book. With the mountain of research accumulated from making these three short documentaries, I starting thinking about a book. I approached a literary agent who shopped it around and landed a major publisher in New York, Palgrave-Macmillan. Nine years after that rafting trip in 2005, the book version of Meltdown in Tibet has finally been published. It took the legwork of three documentaries to pull all the research together. The challenge was to take the mass of information and distill it and make the situation clear to the average reader. That's a skill I learned from writing guidebooks. The story of the devastation of Tibet's environment, and the tremendous impact this will soon have on the nations downstream in Asia, simply must be told. This environmental horror story has been under-reported by Western media or not reported at all, hence the necessity of an unusually long subtitle for the book: China's reckless destruction of ecosystems from the highlands of Tibet to the deltas of Asia. Michael Buckley's 256-page hardcover with three maps and an eight-page colour insert is available in Canada via Raincoast Books. An ebook is also available online. For details of the documentary Plundering Tibet, which is about damming Tibet, see www.WildYakFilms.com.